Mysureans are fortunate to have a large area of (4,000 hectares) Reserve Forest within the city limits with a variety of plants and trees providing shelter to many birds, animals and even fish in downstream lakes. The temperature of the city is also 3 to 5 degree centigrade less than compared to adjoining city areas. One of the most important components of the city’s green space is Chamundi Hill that virtually guards the city from rising temperature. Unfortunately, of late there is indiscriminate development of the Hill that should ideally be left for the forest cover to expand and flourish. Coming to the Hill per se, an area on the top has been declared as notified area where unplanned, haphazard construction have resulted in the accumulation and dumping of waste, short supply of water, degrading natural forest eco- systems around. The temple authorities demand more forest lands on top in the name of development. Under the Forest Conservation Act, 1980, no forest area shall be released without the prior approval of Government of India (Ministry of Environment, Forest and Climate Change), for non-forestry purposes. This implies that no more forest land on top of the Hill should be made available for any non-forestry purposes in the interest of conservation and preservation of unique and valuable forest ecosystems of this Hill. The development plan of Chamundi Hill should take into account all the above issues and restrict the plan to basic minimum and essential requirement. The plan should cover both Reserve Forest as well as highly disturbed notified areas. There should not be any guest houses and other facilities to stay on top overnight as the city centre is hardly 12 kms away. The number of vehicles going up should be restricted enforcing only bus journeys from below by parking their vehicles in the parking lot as is being done during festive occasions. A well-planned ropeway at an appropriate location would also reduce vehicle movements, provided its objectives are clear and established not for a joy-ride but to help and reduce traffic movement and congestion. This will also reduce the journey time of devotees as well as fuel requirement of vehicles. People might have seen in Hong Kong, Kuala Lumpur, etc., where cable cars move above tall evergreen forests without any backup roads along the ropeway. 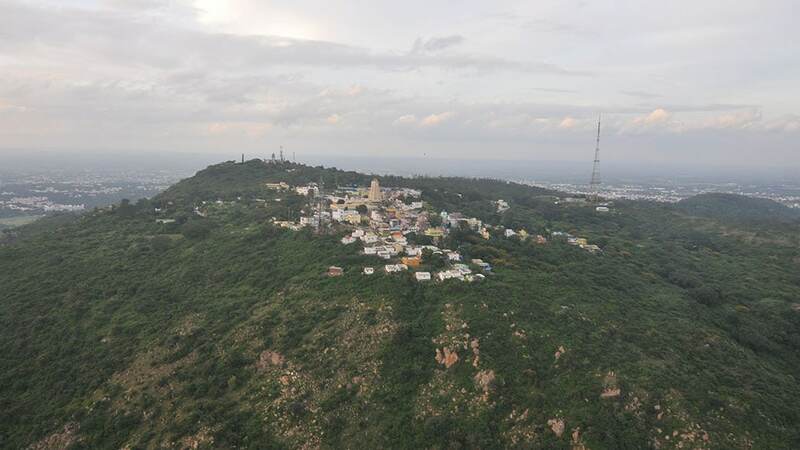 What is actually required is to keep the Reserve Forest of Chamundi Hill green and clean by growing more trees, providing protection and conservation of soil and plant bio-diversity. A management and development plan should be prepared covering the Hill, both notified areas and Reserve Forests, and finalised after a public hearing or a seminar. Greening the Hill should be given priority in the plan and there is a good scope to do so with available modern technologies. To start with, all Eucalyptus trees should be uprooted as it draws more subsoil water to grow faster. It was planted during 1960s without much thought and made the area more degraded. It is only good for swamps and higher rainfall areas of Australia and is a gross mismatch here. It will not allow any native plants of dry deciduous forest type to come up thus making the area more barren. Therefore, all the eucalyptus trees should be uprooted during monsoon. In order to replenish the area with grass and other suitable species quickly, the latest technology of aerial seeding and periodical aerial spraying of water should be taken up for which this Hill is ideally located. We may hire a suitably modified helicopter for aerial seeding and spraying water. Aerial seeding could be done during July and repeated during September. The seeds selected should be of native species and must be treated in the nursery, coated with pesticides, fertilisers and pre-germinated. Aerial spraying of water could be done immediately and then periodically. The ground watchers should go round the area and see that the seeds are properly buried in the soil. Mysuru is a well-known heritage centre and a popular tourist destination. In fact, this is a tourist-junction from where we can take off to Ooty, Wayanad, Hassan, Chikkamagalur, Kodagu, BRT and MM Hills. This city needs urgent attention from the tourist’s point of view also and greening the famous Chamundi Temple areas and Hill should get the highest priority. Several NGOs are already active and struggling to keep the city clean and green. Kudos to Mysore Grahakara Parishat (MGP) that has started ambitious “Greening Mysuru” project with more members and citizens involved. A plan can be formulated where companies can devote a part of funds under Corporate Social Responsibility (CSR) and contribute in greening the Hill. A small but active committee chaired by DCF, Mysuru Forest Division, would keep the project going with the help of members of local NGOs, other government departments, experts and industrialists.